Qawwali is a genre that goes back centuries and often claimed to be a an innovation by Hazrat Amir Khusrow who used music as a means to spread message of humanity and love. Loved in both Pakistan and India in particular, it is music genre that has massive influence over Bollywood music as well as the overall arts and culture scene of South Asia. Nusrat Fateh Ali Khans ancestors hailed from Jalandhar India but migrated to Layalpoor (Faisalabad now), hence bringing the music influences of both countries. 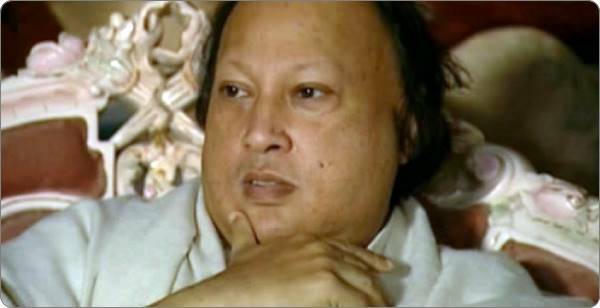 Despite living mere 48 years, Nusrat Fateh Ali revolutionised Qawwali and Sufi music like no other. He used western instruments also in form of his album Dam Mast Qalandar, which was a huge hit and introduced the genre of Qawwali to West as well as Asian countries as far as Russia and Japan. The genre of Qawwali has witnessed many legends such as Sabri Brothers and Aziz Mian. The truth is that nobody actually reach the level that Nusrat enjoyed during his lifetime. To pay tribute to this amazing singer, what better can we do that compiling a Top 10 list of the greatest hits recorded and performed live by the King of Qawwali. Only TheSufi.com allows you to DOWNLOAD MP3, NOT STREAM [like Spotify and iTunes]. So once you download the track, it is YOURS and you can listen millions times without using further data.